The state election in the German Mecklenburg-Vorpommern last Sunday made the headlines of many international news reports. For the first time, the new emerging Alternative for Germany (AfD), which is considered a right-wing populist protest party, won more votes than the governing Christian Democratic party of Chancellor Angela Merkel. Observes interpret the support for AfD as protest voting: against Merkel’s asylum policy, against European integration policies, or against the political establishment (see for example BBC , Spiegel Online , or Reuters ). In light of the recent success, the question arises to what extent the party is still a protest player or rather a potential player in government – in its self-perception as well as from the outside perspective. In my opinion, we can learn from the latest election results in Mecklenburg-Vorpommern that AfD supporters care more about the protest than political impact. The state election system is the same mixed system as applied for national elections in Germany, but also in New Zealand: voters have two votes, a first one for a candidate in a single member district, and a second one for a party. SMDs (single member districts) usually set incentives for strategic voting; citizens vote for second and third preferences rather than the first choice to ensure that their vote makes a difference (Cox 1997, Duverger 1959). If a voter’s first choice is a new party like the AfD, s/he has little information as to how many voters in the district will support the favorite party in the election. This makes it more rational to vote for the established candidates to ensure an actual impact on candidate selection (Willey 1998). In addition, parties on the extreme ends of the political scale like the AfD are unlikely to win pluralities in SMD elections which tend to favor moderate competitors (Horowitz 2003). Despite these established expectations about the rational voter, the AfD managed to win not only 20.8% of the party votes, but even 21.9% of the SMD votes. The AfD, yet, performed poorly when it comes to the translation of direct candidate votes into seats as it won only in 3 of 36 SMDs, which means it gained a mere 8.3% of the direct mandates. 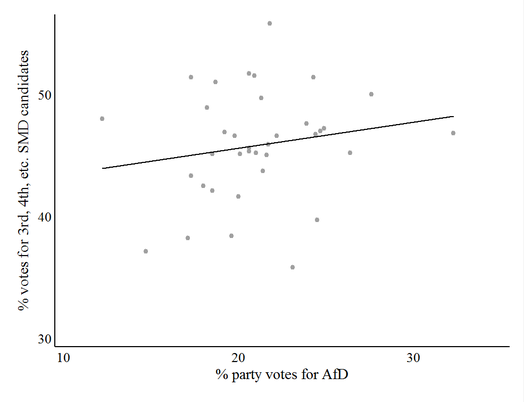 The support for the AfD in party votes in a district serves as a good predictor for the level of irrational voting behavior in the same entity. In Figure 1, you see a scatter plot of the share of party votes for the AfD in a district (which indicates the share of citizens holding a strong preference for this party), and the share of wasted votes in the respective SMD (which are votes for non-winning candidates). The more votes the AfD won in a district, the higher is the proportion of votes given to second, third, forth, and so forth placed candidates. In parallel, Figure 2 displays the share of votes given to third or worse placed candidates in a district, again predicted by the share of voters holding a strong preference for the AfD. The relationship is positive and suggests that a high share of votes for the AfD goes hand in hand with a high amount of votes for candidates with little chances to win the direct mandate. Figure 1: Scatter plot and linear fit of the party vote share for the AfD and the proportion of wasted SMD votes in a district for the 2016 state election in Mecklenburg-Vorpommern. Figure 2: Scatter plot and linear fit of the party vote share for the AfD and the proportion of SMD votes for 3rd or worse placed candidates in a district for the 2016 state election in Mecklenburg-Vorpommern. Annotations: The dots in Figure 1 and 2 show the precise results in a district, the line shows a linear fit between the two variables. All data is available for download at the website of the electoral commission of Mecklenburg-Vorpommern ; the commission provides macro level information on the vote share for parties and candidates in all districts. Lastly, the correlation between the share of party and candidate votes in a district also suggests that AfD voters are particularly likely to vote for the same party and ignore the winning chances of their favorite (see Table 1). The share of party votes for the AfD in a district predicts 95% of the variation in the share of candidate votes for the party. This is a stronger relationship than for all other parties. Table 1: Correlation between the party vote share and the vote share for the SMD candidate in a district for different parties. Even though this short analysis has to remain at the macro level, it shows that districts with many voters supporting the AfD over other parties are also the districts with the highest amount of irrational voters. 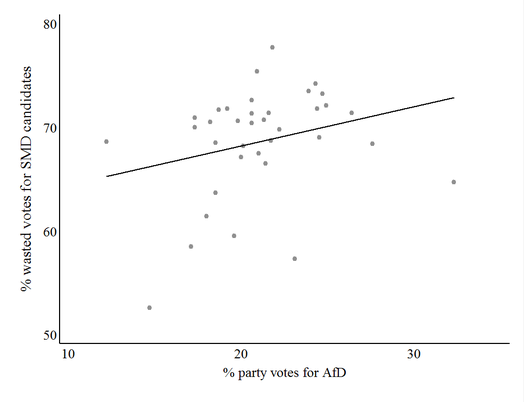 This suggests that voters whose first choice is the AfD tend to cast both votes for the party, even though their candidate vote is likely to be wasted and is actually wasted in most cases. This is just another piece of evidence supporting the claim that AfD supporters are protest voters. They consciously accept to waste their impact on who is elected to the legislature in order to speak for the SMD and rather show their support for a party unlikely to win in the first place. They chose to express their dissatisfaction with policies and established politicians with their vote rather than to make a political impact. Cox, G. W. (1997), Making Votes Count: Strategic Coordination in the World's Electoral Systems (Cambridge: Cambridge Univ Press). Duverger, M. (1959), Political Parties: Their Organization and Activity in the Modern State (London: Methuen & Co). Horowitz, D. L. (2003), 'Electoral Systems: A Primer for Decision Makers', Journal of Democracy, 14(4), 115-27. Willey, J. (1998), 'Institutional Arrangements and the Success of New Parties in Old Democracies', Political Studies, 46(3), 651-68. A short time ago, we analyzed whether Duverger’s assumptions on the mechanical and psychological effects of electoral systems also hold for our data set. In this post, we go a step further and assess the temporal patterns of these effects with regard to electoral system change. For this purpose we estimate a time-series cross-sectional (TSCS) model to analyze legislative elections in Portugal between 1975 and 2011. Portugal, applying a PR system, was selected for this purpose because of its stable number of 20 constituencies over the whole analyzed period of time with district magnitudes ranging from 2 to 58. As the electoral districts were exposed to continuous changes in magnitude over time, Portugal constitutes a highly suited object of investigation for our assumed dynamic effects. We make use of a difference-in-difference time-series model aiming at addressing the hypothesized temporal dynamics and the problem of endogeneity. For this model, we include differenced variables to address the expected temporal dynamics and changes in the ENLP and ENEP as well as the logged district magnitude. The ENLP is used to model the mechanical effect. We use the ENEP for modelling the psychological effects. Figure 2 gives an overview of the development of the two dependent variables over the examined period of time in all 20 Portuguese electoral districts, revealing substantial fluctuations in the ENLP and ENEP to be observed over time but also considerable geographical differences. While there is nearly the whole time an ENLP greater than three for the largest district, Lisboa, the Acores, as a much smaller district, show up with numbers around two parties. Furthermore, the figure illustrates the close relation between the two dependent variables, both showing a peak during the mid-1980s in the most constituencies. 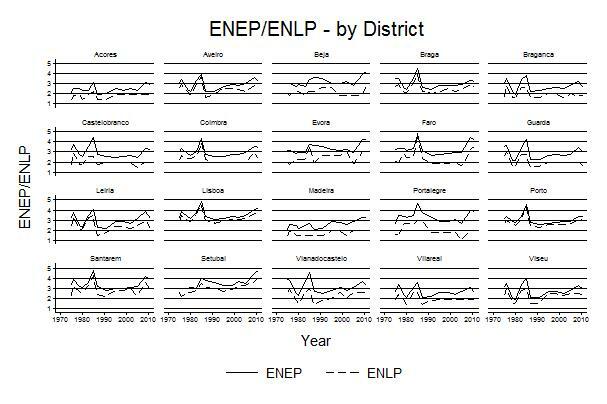 However, the average change of the ENLP and ENEP in the Portuguese constituencies is clearly unincisive. The difference-in-difference model finally illustrates the effect of logged district magnitude on the ENLP and ENEP. For the mechanical effect, as expected, there is a positive effect of district magnitude on the ENLP in the first election immediately after a change in the electoral system, however, the effect achieves only marginal significance. In the subsequent elections the effect disappears but becomes significant again in the fourth election after the change in district magnitude occurred. Also for the psychological effects the dynamic model meets the expectations. So, we find no effect of changing district magnitude on the ENEP in the first three elections following the change of the electoral system. However, in the fourth election the positive effect of district magnitude on the ENEP emerges. To put it in a nutshell, we found evidence that the mechanical effect of an electoral system sets in immediately to shape the ENLP. As expected, the psychological effects become apparent only after several subsequent election, i.e. set in significantly later than the mechanical effect. According to this, our findings largely support the supposed effects. But still there are aspects concerning the relation between district magnitude and party system fragmentation that await further investigation. For the future research on these phenomena we will expand our TSCS model to further cases to broaden the empirical basis of our results. What happens when electoral rules change? This is the crucial question that guides the scientific interest of our research project. Amongst other phenomena, we address this question with regard to the consequences of electoral system change on party system size. One of the most relevant factors bringing the effects of electoral systems on party systems about is district magnitude, as it is highly critical to the number of parties that can finally achieve parliamentary representation. Therefore, in particular we are interested in the effects of district magnitude on the effective number of electoral (ENEP) and legislative parties (ENLP). In his famous “sociological laws” already Maurice Duverger proposed that single-member district plurality systems (SMD) tend to favor two party systems, while electoral systems of proportional representation (PR) tend to lead to multi-party systems. Following Duverger, this is caused by two mechanisms. The first is the mechanical effect of an electoral system that depicts the mathematical transformation of votes into legislative seats. The second is the psychological effect, describing the strategic behavior of voters and party elites in anticipation of the mechanical effect to avoid wasting votes and resources. Hence, we would expect that a change of electoral rules mechanically affects the ENLP immediately following the reform. To test this expectation empirically, we make use of our data set that at present contains information on electoral systems, election results and party systems for 11 European democracies, covering the period of time since 1946 for the case of Belgium. Additionally, our data allows us to analyze the mechanical and psychological effects at the constituency-level. All in all, the data set comprises more than 7.000 electoral districts. The electoral systems applied in the 11 countries in our sample are either PR systems or systems of mixed-member proportional representation (MMP), i.e. systems combining rules of PR and SMD. District magnitudes in the sample range from single member districts to constituencies with a magnitude of 58 at maximum. A pooled cross-sectional analysis of the whole data set, investigating whether this “classical” procedure of analyzing the effects of electoral systems works accordingly, suits our models with ENLP and ENEP as dependent variables. The logged district magnitude constitutes the key independent variable. Figure 1 illustrates the relation between logged district magnitude and the effective number of legislative and electoral parties. 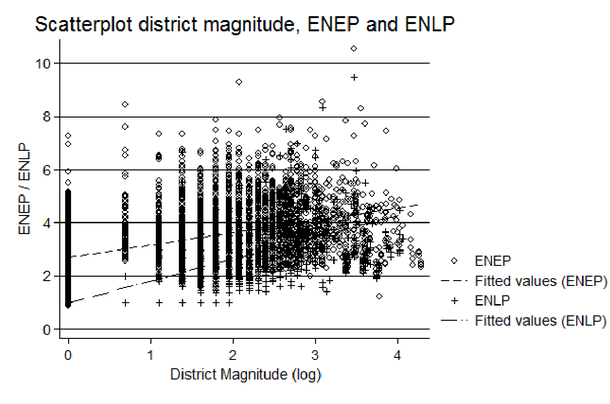 As Figure 1 depicts, there is a positive effect of district magnitude on the ENLP as well as the ENEP. A larger district magnitude usually seems to be associated with a higher effective number of legislative and electoral parties. The figure illustrates as well that there is a stronger effect for the ENLP as its fitted line shows a sharper increase compared to that of the ENEP. In conclusion, our analyses show a positive effect of district magnitude on party system size. These findings support the expectations that more proportional electoral systems, i.e. systems with a higher district magnitude, are associated with a higher number of parties that make it into parliament as well as a higher number of parties that receive votes at all. After examining the effects of district magnitude on the ENLP and ENEP with a pooled cross-sectional model, in a next step we will have a closer look on the temporal patterns of the mechanical and psychological effects of electoral systems and their change. In this respect, we expect the mechanical effect to set in immediately following an electoral system change and to have an impact on the ENLP (see above). Furthermore, it should be rational that changes of electoral rules psychologically affect the ENEP receiving votes significantly later than the mechanical effect, as we expect voters to need some time to strategically adapt their voting behavior to the altered electoral system. We will cover these temporal dynamics of electoral reform in our next post! As we wait for final results of the Saturday election in Canada, here are some thoughts about the effect of the number of canidates running on the level of informal voting in Senate elections (see also our first post on the effects of the number of candidates on below-the line voting). In the rationale of the recently introduces reform, by abolishing Group Voting Tickets the number of candidates on the ballot paper should be reduced and thus make Below-the-Line-voting less timely and more attractive. Moreover, the margin of error voters are allowed to make when ranking their preferences is increased from three to five, as along as 90% of the ballot paper is filled correctly. (For the bill see https://www.legislation.gov.au/Details/C2016C00222). Between 2001 and 2013, on average 3% of votes for Senate elections were declared invalid because of informality. A survey conducted in 2001 by the Australian Election Commission showed that 47% of informal votes are caused by erroneous BL- voting (AL-voting 4%, blanks 34%). In this context, one could assume, that the overall share of informal votes increases with the number of candidates, as it is rational to believe that the more boxes to fill, the harder to avoid mistakes (e.g. indicate preferences for 100 candidates). 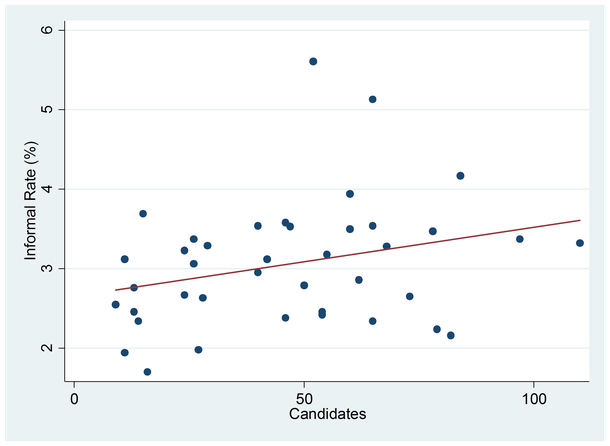 The number of candidates and the share of informal votes at the aggregate level display a weak but positive correlation ( see Graph ). However, shifting the focus to the state level again, the effect of the number of candidates on the informal rate reveals differing results (see graph below). 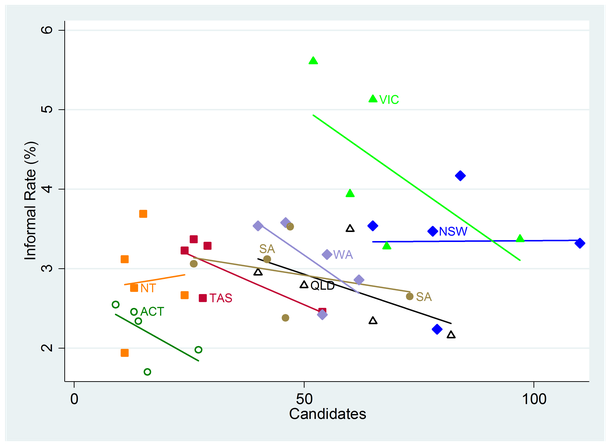 Except of the jurisdictions of Norther Territory (NT) and New South Wales (NSW), all correlations are negative, indicating the opposite relationship than the one at the national level. At the state level, the rate of informal votes decreases with the number of candidates. Even in territories, where voters usually do not vote BL in state elections, the overall rate of informal votes decreases with the number of candidates. 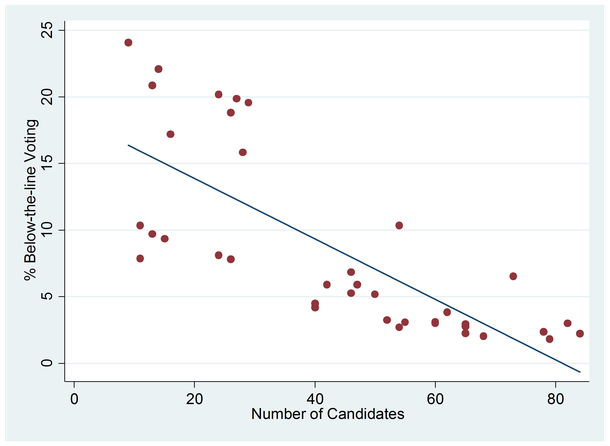 This suggests that votes might pay greater attention when ranking a large number of candidates rather than the contrary. These resukts indicate that reducing the number of candidates does not seem to increase the share of correctly caseted votes. Moreover, they highlight once again the importance of moving the focus beyond the aggregate level even within one single country. Hence, experience with electoral systems from regional elections as well as district level data matter. The effects of electoral rules should not be considered universal and thus, contextual factors need to be considered when analyzing electoral system effects. On July, 2 2016, Australia will vote for the first time under the new electoral system introduced earlier this year. The reform aims to simplify the Senate’s voting system which was a complex and opaque form of the single transferable vote. A controversial feature of the old system was the above- and below-the-line voting option: Above-the-line (AL), voters cast a valid vote simply by entering the number 1 for the party of their choice. Below-the-line (BL), they must indicate a full set of preferences and rank all candidates, which can mean numbering dozens of boxes. Hence, majority of the electorate usually decides to vote AL. The reform aims to cope with these complexities by introducing optional preferential voting and abolishing Group Voting Tickets so that voters can more easily express their vote according to their preferences when voting AL. Moreover, it targets to facilitate BL-voting in two ways. First, by abolishing Group Voting Tickets, parties with few votes will have fewer chances to get elected while parties that poll well on the first preferences will be rewarded. Micro-parties should be discouraged from running due to a lack of preference deal outcomes. Hence, by abolishing Group Voting Tickets the number of candidates on the ballot paper should also be reduced and thus make BL-voting less timely and more attractive. Secondly, the margin of error voters are allowed to make when ranking their preferences is increased from three to five, as along as 90% of the ballot paper is filled correctly. (For the bill see https://www.legislation.gov.au/Details/C2016C00222). This reform plan suggests that the number of candidates is decisive for voters when choosing between AL- and BL voting, as the rationale behind the proposed reform is that fewer candidates will increase the incentives for BL-voting. Let's have a look how the number of candidate’s affected the share of BL-voting in previous elections. Between 2001 and 2013, on average only 8 % of the electorate chose to vote BL. If we have a closer look at the relationship between the share of BL-voting and the number of candidates, there seems to be a negative correlation at the overall country level. However, this aggregate figure is rather misleading. Let's have a closer look at the jurisdictional level. As this second graph shows, the share of BL-voting varies strongly by jurisdiction. 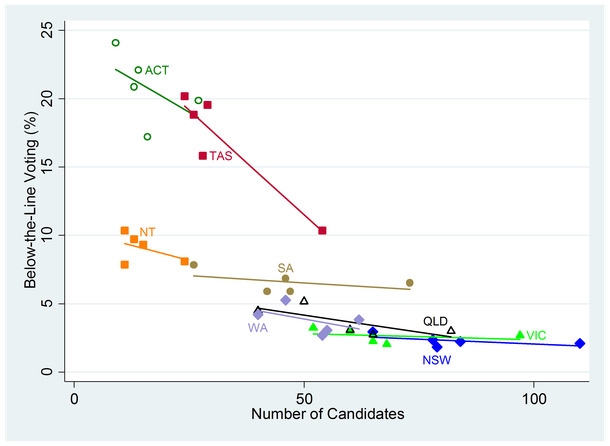 In Tasmania (TAS) voters have a long experience with BL-voting in state election, below-the-line voting makes up a significant proportion (on average 17%), in the Australian Capital Territory (ACT) even 20%. These states also have comparatively small ballots (TAS: 32 candidates and ACT: 16 candidates compared to Queensland (QL) with on average 59 candidates and 4% of below-the-line votes). When disaggregating the level, BL-voting seems rather determined by state and not necessarily by the number of candidates. In most jurisdictions (with exception of TAS and ACT) the regression line is not steep but rather close to flat. This does not indicate a strong negative correlation as on the aggregate level. Territorial, contextual factors seem to be more decisive for voter’s choice than the number of candidates. In light of the Austrian electoral reform, decreasing the number of candidates cannot be viewed as panacea for the complexities that arise with BL-voting. It also needs to be taken into consideration that, in order to vote BL, voters first of all need to have preferences for dozens of candidates. Hence, most likely, only well-informed voters regard BL-voting as an option. It seems unlikely that the reform will strengthen BL-voting. However, reasonably replacing Group Ticket Voting by optional preferential voting will give voters more control over their preferences, without timely preparation for making informed choices about dozens of candidates.